Walkabout received the Distinguished Service Cross, Purple Heart, five Silver Stars and five Bronze Stars. 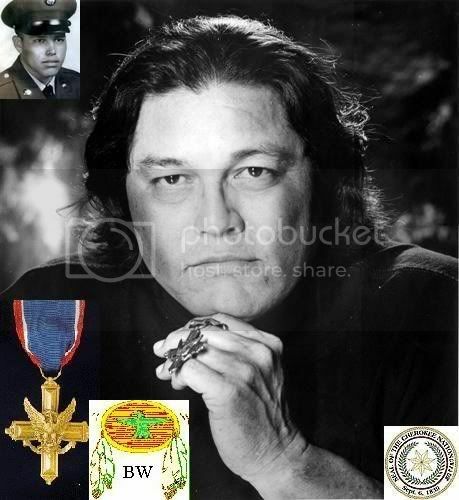 He was believed to be the most decorated Native American soldier of the Vietnam War, according to U.S. Department of Defense reports. Walkabout was born in Cherokee County, Okla. and lived much of his life in Oklahoma. At the time of his death, Walkabout and his wife, Juanita Medbury-Walkabout, lived in a portion of eastern Connecticut that is home to many Mashantucket Pequot, Mohegan and other Native American tribal members. Walkabout's official cause of death was not given. The Native American Times reported on its website that he had been fighting complications of exposure to Agent Orange, a defoliant used by the military during the Vietnam conflict. Walkabout, a Cherokee of the Blue Holley Clan, was an 18-year-old Army Ranger sergeant when he and 12 other warriors were sent on an assassination mission behind enemy lines on Nov. 20, 1968, in a region southwest of Hue. However, they ended up in the enemy's battalion area and came under fire for hours, during which he was seriously wounded. Several of the other 12 men were killed at the scene, while the rest later died of their injuries.